Degas's laundress paintings paralleled his more famous ballet dancer series. For both he studied the precise movements of women at work. 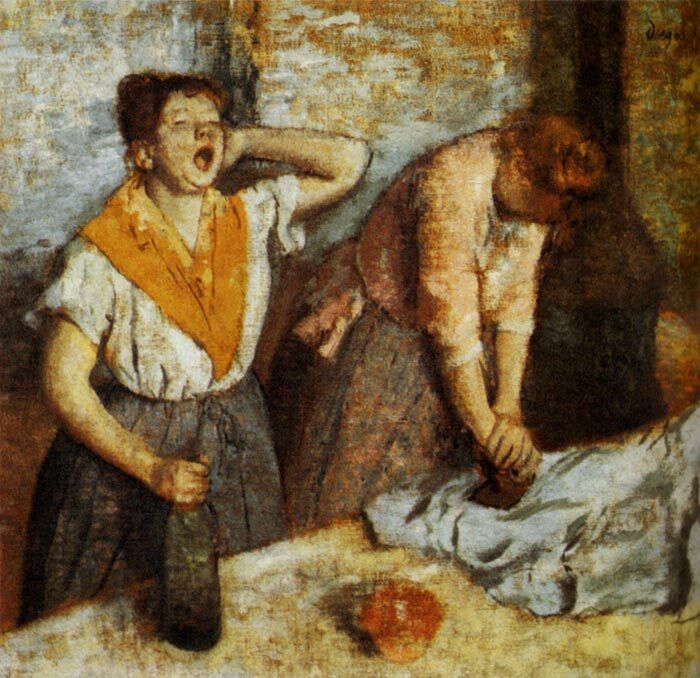 The art of Degas was that of a 'Naturalist', depicting what was considered vulgar - laundresses were commonly thought of as borderline prostitutes - in a way that was almost scientific. A double viewpoint is used in Women Ironing - looking straight at the women's face and down at their boards. Their outlined and cropped figures also indicate Degas's debts to both Japanese art and snapshot photography. SPECIAL NOTE : The painter will make the reproduction as close to the original oil painting as possible. If you want your painting to alter from this likeness, please email us and " Women Ironing, 1884-1886 " will be reproduced according to your special requirements.